Histologically, schwannomas display a biphasic pattern of Antoni A and Antoni B tissue (Figure 1). Antoni A is characterized as highly vascular hypercellular tissue composed of spindle cells, which are closely packed cells with fusiform nuclei.10 Antoni B tissue is a less dense, loosely arranged hypocellular region.2 An ancient change may occur that results in the loss of Antoni A tissue, the formation of cysts, hyalinization of the matrix, and calcification. Pathology of a schwannoma. Histology slide of the Antoni A cellular area of the schwannoma (original magnification ×200) (A). Histology slide of the Antoni B myxoid area of the schwannoma (original magnification ×200) (B). Preoperative sagittal T1-weighted magnetic resonance image of a schwannoma (A). Preoperative sagittal T2-weighted magnetic resonance image displaying a classic target sign. The low to intermediate signal intensity region in the center of the schwannoma represents the Antoni A cellular tissue. The surrounding high signal intensity region represents the myxoid Antoni B tissue (B). Preoperative axial T1-weighted magnetic resonance image of an intermuscular schwannoma arising from the median nerve in the right arm (A). Preoperative axial T2-weighted magnetic resonance image displaying a classic target sign. The low to intermediate signal intensity region in the center of the schwannoma represents the Antoni A cellular tissue. The surrounding high signal intensity region represents the myxoid Antoni B tissue (B). Preoperative axial T1-weighted magnetic resonance image of a schwannoma displaying a split fat sign and intermediate intensity (A). Preoperative sagittal T2-weighted turbo spin-echo magnetic resonance image of a schwannoma displaying a split fat sign. The 2 arrows indicate the fat at the upper and lower poles of the lesion (B). Preoperative axial T2-weighted magnetic resonance image displaying a schwannoma with heterogeneous appearance typical of most schwannomas in this study. The mass is predominantly hyperintense (Antoni B) with scattered hypointense (Antoni A) areas (C). Intracapsular enucleation is the most effective treatment for schwannomas.14 However, this procedure has often resulted in high rates of neurological deficit.3,4,6,9,14–16 The purpose of this retrospective chart review was to describe the principal investigator's (J.C.W.) intracapsular microenucleation technique and report on the clinical and radiological presentations and outcomes of 20 patients with schwannomas. 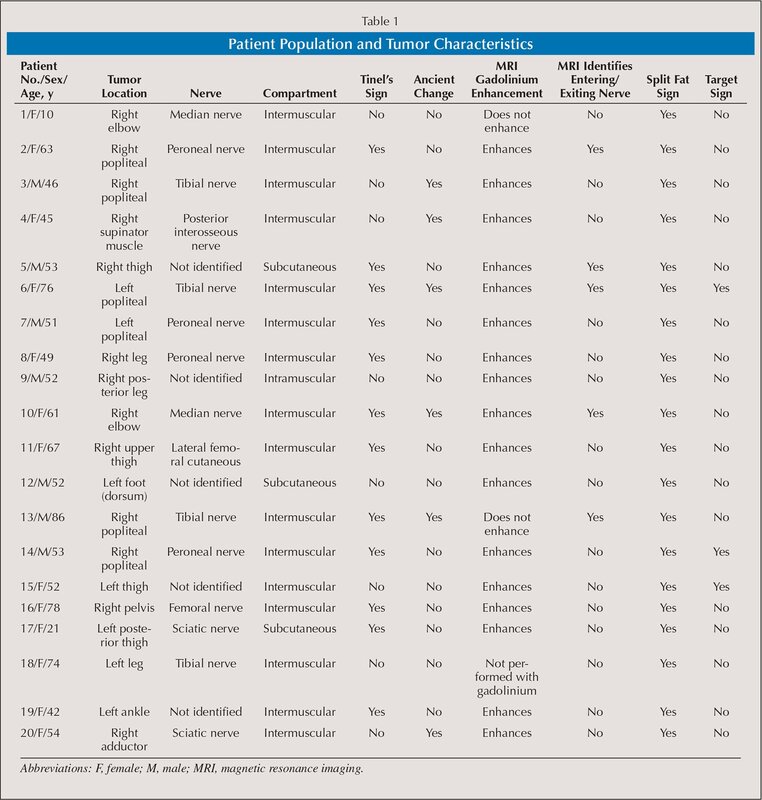 The authors conducted a retrospective chart review of 20 patients—13 females and 7 males—who underwent surgical schwannoma excision by the principal investigator between 2007 and 2015. Approval to conduct this study was granted by the Hackensack University Medical Center's Research Review Board. The cohort represents every schwannoma patient on record during that period. All patients with suspected schwannomas who presented to the principal investigator underwent surgical excision because the possibility of incorrect preoperative diagnosis or malignant transformation presented too great a risk to avoid excision. All diagnoses were confirmed via histopathological examination. Twelve patients presented with a positive Tinel's sign. A classic target sign was observed on only 3 MRIs (Figures 2–3). The other 17 tumors displayed intermediate signal intensity on T1-weighted images and primarily high signal intensity on T2-weighted images with admixed low signal areas (Figure 4C). A split fat sign was observed in all tumors (Figures 4A–B). The nerve was identified entering and exiting the mass on 5 MRIs (Figure 5). Nineteen MRIs were performed with gadolinium. On 17 of these, the mass enhanced homogeneously following contrast administration. Histologically, 6 tumors were characterized as ancient schwannomas. 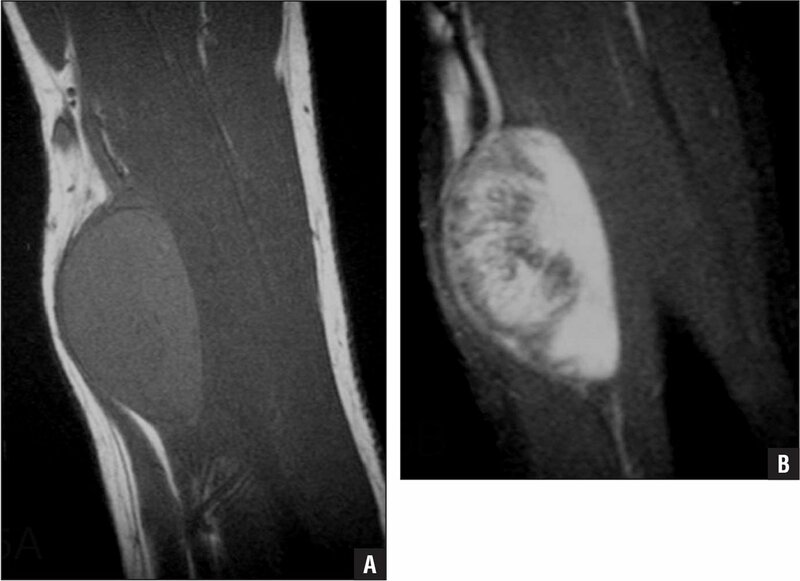 Preoperative sagittal T1-weighted (A) and T2-weighted (B) magnetic resonance images of a schwannoma. A nerve can be seen entering and exiting the mass. The average patient age at the time of surgery was 54 years (range, 10–86 years) (Table 1). Seventeen patients presented with lower extremity schwannomas, with the peroneal and tibial nerves as the most common nerve origins (4 cases each). There were 2 upper extremity schwannomas and 1 schwannoma located in the pelvis. The compartmental location varied: 16 intermuscular, 3 subcutaneous, and 1 intramuscular. Of the 20 cases, all but 5 were associated with a major peripheral nerve. In the cases where a major nerve was not identified intraoperatively, the schwannoma was presumed to have arisen from an inconspicuous sensory or motor nerve. 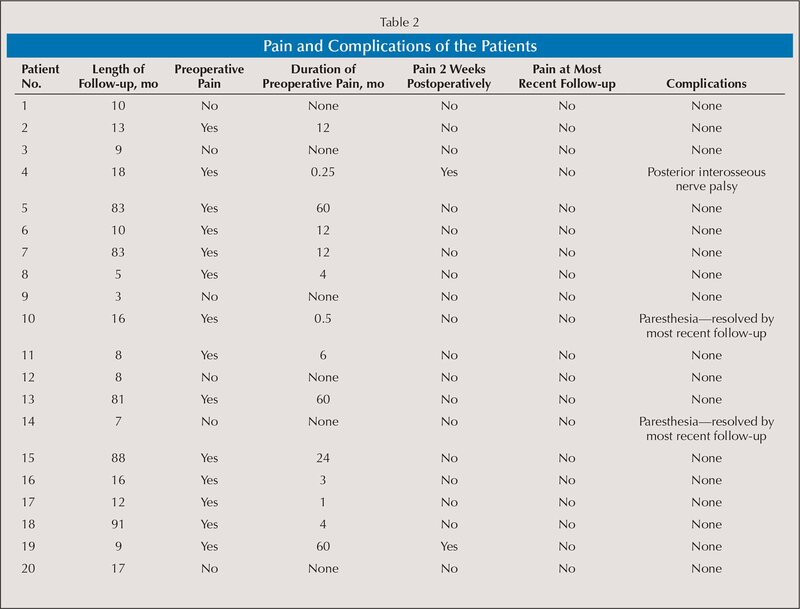 Preoperative pain was common in these patients; of the 20 cases reviewed, 14 presented with this symptom (Table 2). On average, this pain was present for 18.4 months (range, 0.25–60 months) prior to surgical intervention. In all cases, an open incision was made directly overlying the tumor and extended a few centimeters proximal and distal to the palpable extent of the tumor (Figure 6A and Video). When the incision had to be carried over a joint crease, an “S”-shaped opening was created to prevent postoperative contracture. For tumors arising from a major nerve, the nerve was identified and isolated intraoperatively, both proximal and distal to the schwannoma (Figure 6B). For those cases in which the tumor did not arise from a major nerve, an attempt was made to identify a minor branch entering and exiting the mass. In 5 cases, no such nerve could be identified and the mass was removed en bloc. When the tumor arose from a major nerve, the courses of the individual nerve fascicles were subsequently identified along their paths of travel through the epineurium on the contralateral side of the mass (Figure 6C). A fine longitudinal incision was made through the epineurium on the opposite side of the region of the nerve fascicles from the nerve entrance to the nerve exit. The epineurium was bluntly peeled off the mass, and the schwannoma was gently enucleated from the nerve sheath while preserving the nerve fascicles (Figure 6D and Video). The epineurium was left open at the conclusion of the operation (Figure 6E). The gross specimen of the schwannoma was subsequently measured (Figure 6F). There were no fascicles that entered directly into any of the tumors (Video). Schwannoma in the right arm (A). Schwannoma arising from the epineurium of the median nerve. The fascicles are identified coursing through the sheath (B). The nerve fascicles are splayed across the most superficial aspect of the tumor (C). The sheath is opened longitudinally along an area devoid of fascicles (along the deep side of the mass), and the schwannoma is gently and bluntly enucleated from the sheath, leaving the fascicles intact (D). The nerve left intact and the sheath left open (E). Gross specimen of the schwannoma (F). Patients' wounds were closed in a layered manner. Patients were instructed to elevate the extremity for 48 to 72 hours and apply ice intermittently to help control swelling. All patients returned to the office within 2 weeks postoperatively. Follow-up ranged from 3 to 91 months (average, 29 months). The patients with the longest follow-up (range, 80–91 months) were contacted by phone to assess pain, complications, and recurrences. Two weeks after surgery, notable symptoms included 2 cases of paresthesia, 1 case of pain, and 1 case of pain and motor weakness (Table 2). Both patients who presented with postoperative pain had also presented with preoperative pain. There were no cases of hypoesthesia or hyperesthesia. At the final follow-up, all patients were pain free, and 19 had normal sensation and full function of their affected limb. The 45-year-old patient who presented with motor weakness 2 weeks after surgery had developed a posterior interosseous nerve palsy. Approximately 3 months after surgery, the patient underwent electromyography and nerve conduction studies that showed early axonal regeneration to the extensor digitorum communis but not to the extensor pollicis longus or the extensor indicis proprius. 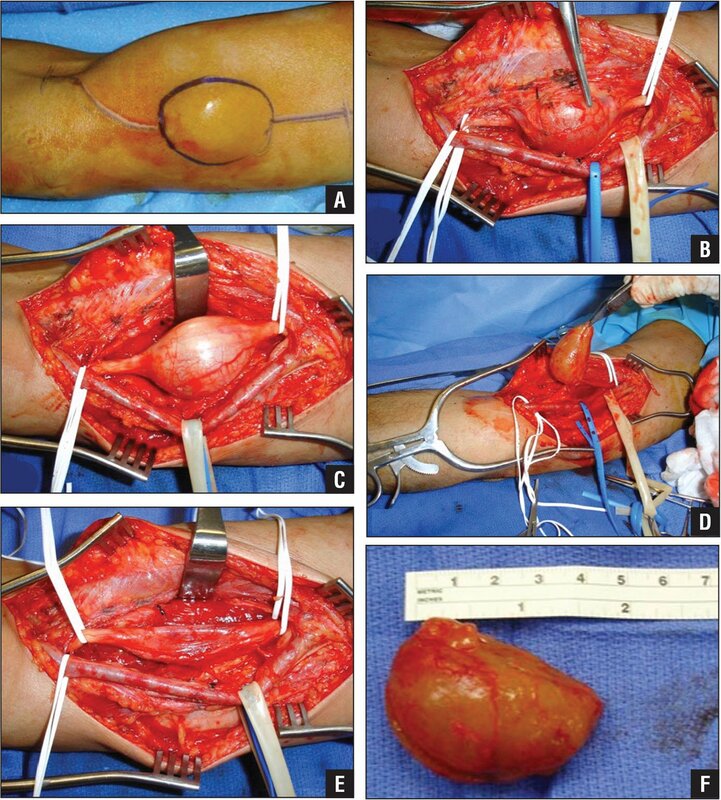 The patient elected to undergo tendon transfers to expedite recovery and has since subjectively regained 80% function of the affected hand (18 months after schwannoma excision). There were no other complications and no local recurrences. All patients who underwent schwannoma excision are currently alive. Schwannomas are the most common peripheral nerve tumors, and their treatment has been addressed in several studies. However, the authors of these studies report a variety of results in terms of clinical and radiological presentation, surgical technique, pain eradication, and complications.2–4,6,9,11,14–19 The current study aimed to rectify the discrepancies between these studies and clarify the best methods for diagnosis and treatment of schwannomas. Knight et al2 suggested that a Tinel's sign is the clinical symptom most useful for diagnosing a schwannoma, with 155 (81%) of their 234 patients experiencing the percussion-induced, painful tingling sensation. Studies by Park et al9 and Donner et al17 reported a preoperative Tinel's sign in 56 (100%) of 56 cases and 84 (99%) of 85 cases, respectively. The current study found 12 (60%) of 20 cases to have a preoperative Tinel's sign, which is consistent with the 12 (60%) of 20 cases reported by Kang et al18 and the 23 (68%) of 34 cases reported by Adani et al,4 both of whom examined schwannomas of the upper extremity. The current results suggest that the Tinel's sign is helpful in diagnosing a schwannoma because it is present in most patients. However, the absence of a Tinel's sign does not negate the possibility of a schwannoma. Preoperative pain is another important clinical symptom for schwannoma diagnosis. Seventy percent of patients (14 of 20) reported pain at the tumor site prior to surgical intervention; the pain had been present for an average of 18.4 months (range, 0.25–60 months). Although Adani et al4 reported preoperative pain in only 12 (35%) of 34 patients, most schwannoma studies have reported far longer durations of preoperative pain.2,9,14,15,19 The pain from a schwannoma can mimic other conditions, such as sciatica. Schwannomas can also be difficult to identify on physical examination, which may lead to a delay in diagnosis. The current study confirms the often-prolonged duration of painful symptoms prior to accurate diagnosis. Similar to the absence of a Tinel's sign, the absence of pain in the setting of a mass with radiographic features suggestive of a schwannoma does not negate the possibility of the tumor being a schwannoma. Preoperative MRI can be highly suggestive of a schwannoma if there is a characteristic split fat or target sign, or if the nerve of origin can be visualized entering and exiting the mass. The authors found a split fat sign to be the most common feature of the schwannomas in their study. 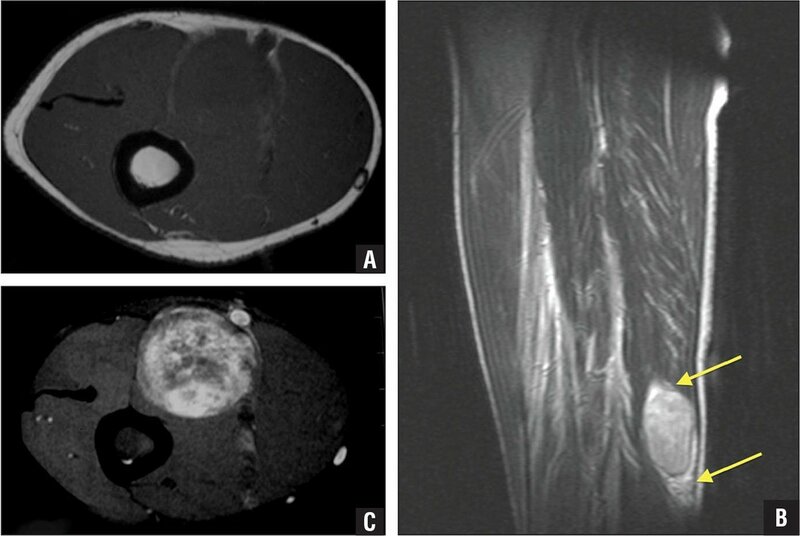 All 20 schwannomas displayed a split fat sign on MRI. Although a split fat sign is not specific to peripheral nerve sheath tumors, Murphey et al7 found it to be most common in benign peripheral nerve sheath tumors, lesions of large nerves, and tumors with intermuscular origin. Most of the tumors in the current study fit the description by Murphey et al.7 However, notable exceptions included 5 tumors arising from extremely small nerves that could not be identified, 3 tumors with subcutaneous origin, and 1 tumor with intramuscular origin. Five of the MRIs in this study identified a nerve entering and exiting the mass. Only 3 (10%) of the current patients displayed a target sign on MRI. This is in contrast to the report from Adani et al4 of a target sign in 17 (50%) of 34 cases, the report from Date et al14 of a target sign in 18 (50%) of 36 cases, and the report from Koga et al11 of a target sign in 118 (59%) of 199 cases. Most of the current patients presented with a mass that was predominantly T2 hyperintense with scattered low signal areas, suggesting that the Antoni A areas were not coalesced in the center but rather scattered throughout the mass. The relative rarity of target signs in this cohort was perhaps attributable to the small sample size or may instead indicate that the true prevalence of target signs is less than previously reported in the literature. Sawada et al16 suggested that postoperative neurological deficit could be a result of fascicle damage during the procedure due to the incision of the epineurium or compression of fascicles not involved in the tumor. Park et al9 suggested that nerve dysfunction results from the transection of nerve fascicles that run through the tumor. Donner et al17 often found the fascicles running through the tumor to be nonfunctional. The current study found a relatively low rate of nerve complications compared with other studies. This may be because the authors used a nerve dissection technique in which the nerve is isolated both proximal and distal to the tumor and hence released (neurolysis performed) from the surrounding tissues. The course of the fascicles along the mass is identified, and great care is taken to ensure that the incision through the sheath is directly opposite the fascicles and that the mass is enucleated gently by bluntly peeling the epineurium off the mass and the mass off the underlying fascicles. The nerve sheath is not closed, and if bleeding occurs, blood is not trapped within the nerve sheath (something that could result in a crushing of the fascicles). There were no patients in this study in whom fascicles were identified as entering directly into the mass. There were limitations to this study. The sample was small. Additionally, the study was performed as a retrospective analysis following the removal of schwannomas from different anatomical locations and nerves. Finally, the tumors were removed at different points in time. Despite these limitations, this study provides important information as to how surgeons should approach the diagnosis and subsequent surgical excision of schwannomas. Although the classic imaging signs are not present in all patients, the combination of a thorough physical examination and radiological evaluation is enough to elicit the correct diagnosis of schwannoma. The authors have found a Tinel's sign, preoperative pain, and a characteristic split fat sign on preoperative MRI to be the clinical symptoms most useful for diagnosing a schwannoma. Additional signs on preoperative MRI that were less common in this study, but that can also be suggestive of a schwannoma, are a target sign and visualization of the nerve of origin entering and exiting the mass. Following proper diagnosis, schwannomas can be safely removed via intracapsular surgical excision with minimal complications, yielding complete eradication of preoperative pain, normal sensation, and full function. Antonescu CR, Stratakis CA, Woodruff JM. Nerve sheath tumors. In: Fletcher CDM, Bridge JA, Hogendoorn PCW, Mertens F, eds. WHO Classification of Tumours of Soft Tissue and Bone. Vol 5. 4th ed. Lyon, France: IARC; 2013:170–172. Koga H, Matsumoto S, Manabe J, Tanizawa T, Kawaguchi N. Definition of the target sign and its use for the diagnosis of schwannomas. Clin Orthop Relat Res. 2007; 464:224–229. The authors are from the Frank H. Netter MD School of Medicine at Quinnipiac University (JH), North Haven, Connecticut; and Hackensack University Medical Center (ITO, JCW), Hackensack, and Robert Wood Johnson Medical School (IJG, APD), New Brunswick, New Jersey. Correspondence should be addressed to: James C. Wittig, MD, Hackensack University Medical Center, 20 Prospect Ave, Ste 501, Hackensack, NJ 07601 ( drjameswittig@gmail.com).